Our September 6th Newsmaker is Stephen Moore. Stephen Moore is an economist and writer. Moore is a Distinguished Visiting Fellow with the Heritage Foundation and a Founder, along with Art Laffer, Steve Forbes and Larry Kudlow of the Committee to Unleash Prosperity – a group dedicated to free market principles and economic prosperity for all. Moore founded and served as president of the Club for Growth from 1999 to 2004. Moore is a former member of the Wall Street Journal editorial board. Moore is known for advocating free-market policies and supply-side economics. In 2017, he left Fox News Channel to join CNN as an economics analyst. Moore’s work continues to appear regularly in the Wall Street Journal, The Washington Times, and various publications including The Weekly Standard and National Review. Tom Del Beccaro: Steve, thanks so much for being a part of the Launch of the new PoliticalVagnuard.com and talking to us today about this important issue of tax reform. Del Beccaro: Steve, I have five questions for you about tax reform. So, let’s get started. Question No. 1. In your view, why is tax reform so important at this time? Steve Moore: We are long overdue for a major tax reform. President Obama became the first President to not have a single year of economic growth over 3%. Indeed, over the last decade our economic growth has been below 2%. That is simply too slow to produce the number of jobs and the wage growth that we need in America today. President Trump has taken the right step in reducing the regulatory burden that built up over the last decade and more and which was hampering growth. The other prong to that effort must be tax reform. Tax reform can bump up growth by nearly one percentage point a year. That will increase federal revenues by $3 trillion over a decade and help create 20 million new jobs over the decade. Question No. 2. You are fond of saying that “economic growth cures a lot of problems.” What do you mean by that? Steve Moore: Economic growth is so very important on so many levels, including determining our standard of living and affecting government revenues and therefore the national debt. Economic stagnation, on the other hand, leads to many problems including slow job growth, weak labor markets, stagnant wages and rising deficits as government outlays increase for the unemployed and government revenues weaken or fall. With faster economic growth of just 1% per year, revenues rise by $3 trillion in a single decade, and with that the debt falls every year as a share of GDP. Obviously, poverty levels will fall as we have more jobs and higher incomes. To me, the economic growth rate is the telling statistic. Above 3.5% and we are in good shape. Below that, we run into the troubles I mentioned before. Question No. 3. According to Professor Arthur Laffer, a good friend of yours, there is an “economic effect” to cutting taxes, “a positive impact that lower tax rates have on work, output, and employment — and thereby the tax base — by providing incentives to increase these activities.” Please explain what he means by that. Steve Moore: Art Laffer is making an important point by those words. The core of what he is saying is that changing tax rates have an effect on people’s actions. Some people on the Left don’t believe that. They think if you change tax rates, people won’t take additional risks. That’s just not true. If people are convinced rates will be lower, they will take more risk, invest capital, open businesses and spend money. The opposite is true as well. If they think rates are going to be higher, they take less risk. Put another way, if you tax something, you tend to get less of it. If you tax something less, you get more of it. We overtax work, saving, investment risk taking and entrepreneurship. Lower the tax rate and we will get more of all of that. Question No. 4. Democrat and President John F. Kennedy said that “An economy hampered by restrictive tax rates will never produce enough jobs or profits.” Can you tell us the correlation between tax reform and job creation in your mind. Steve Moore: We need to keep in mind that businesses exist to create profits. They are interested in their after tax rate of return. When tax rates overall are too high, and that includes everything – state, local, federal and regulatory taxes and costs, profits are necessarily lower. On the other hand, if the federal income tax rate of approximately 40% on corporations, and even higher on many small businesses, is lowered to 20%, profits will improve and businesses will be able to expand operations here in the US and bring more jobs to these shores. We can’t compete effectively with the highest tax rates in the world. We should have the lowest. Question No. 5. We have had four major tax reforms since the income tax code came into being in 1913. Each time, the opponents of tax reform have said lowering rates would mean less revenues for government. Each time, however, according to the IRS, revenues rose after the rates were lowered. Yet, even today Senator McConnell talks as if there is no positive effect from tax reform and is demanding spending cuts to “offset” tax rate reductions. I am for spending reduction. But why are they still getting this issue wrong? Steve Moore: So many are getting it wrong and it is a problem. Many don’t understand Art Laffer’s point about how lower rates restore incentives and result in people taking greater risk. Others don’t look at the data objectively because it doesn’t fit with their political agenda. We know that the 3 fastest growth decades were the 1920s, 1960s and 1980s. They were all started with supply side tax cuts. Before those cuts, the economy was either stalled or in recession. It was the change in tax rates that jump started the economy. Growth was high in the 1990s too but we had a big capital gains tax cut. The lesson of history is tax rate cuts create prosperity for all – a rising tide for every income group as the economy expands. That’s why we need tax reform today. Great 5 question interview. 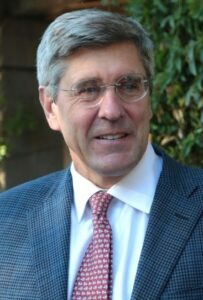 Stephen Moore is solid! I am hoping Trump gets aggressive tax reform passed. Both Trump and the voters still have some swamp draining to do. As always, Steve Moore is articulate in discussing the complicated issues; and. Tom del Beccaro is a skillful interviewer! I enjoyed reading this piece!